Believe it or not, this simple piece of work was spotted on an actual, standing portion of the Berlin Wall. 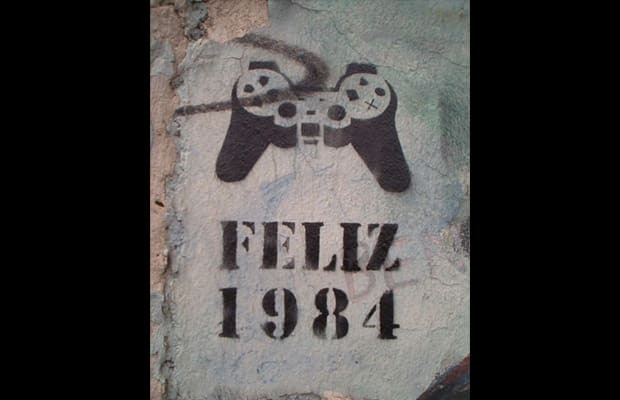 It translates to "Happy 1984," an obvious reference to the dystopian novel by George Orwell. Interestingly, since the graffito was clearly drawn after the Wall's fall (in 1989, whereas the PS1 came out years later), this seems to be more a commentary on modern life than on communism or the Cold War. Bet you weren't expecting to have something to think about when you finished this gallery up. You're welcome!